The momentary rate of vitamin C loss is determined by the rates of three reactions: (1) the degradation of the original ascorbic acid (AA) and the simultaneous (2) formation and (3) degradation of the dehydroascorbic acid (DHAA). 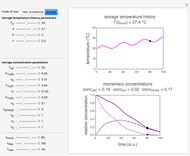 This Demonstration simulates the vitamin's relative concentration versus time curve in a variety of temperature histories of the kind encountered in food heat preservation and storage, together with those of the underlying AA and DHAA. The three curves are calculated by numerically solving two simultaneous differential equations based on the assumptions that the effective or total vitamin C concentration is the sum of those of the AA and DHAA concentrations, and that the progressive changes in these follow fixed-order kinetics. 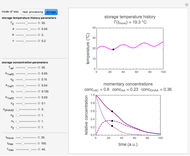 It is also assumed that the temperature dependence of the three reaction rate constants can be described by the exponential model, which is a simpler substitute for the Arrhenius equation. In fresh foods, particularly fruit juices, vitamin C is naturally occurring ascorbic acid (AA), which is also an antioxidant. Upon oxidation, which is accelerated by high processing and storage temperatures, the AA is converted into dehydroascorbic acid (DHAA), which subsequently degrades to other compounds. Since DHAA is biologically active as a vitamin, being converted back to AA in the body, the effective or total vitamin C content of a processed or stored food is the sum of its AA and DHAA contents. where is the rate constant at an arbitrary reference temperature , in a pertinent temperature range. Both and are in °C. This model is a simpler substitute for the Arrhenius equation . Once calculated, the effective or total vitamin C concentration is calculated as the sum of the AA and DHAA concentrations. 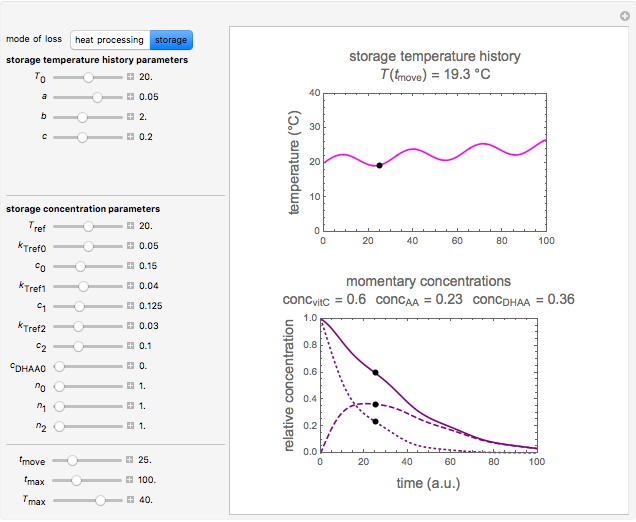 By clicking on the "mode of loss" setter, this Demonstration generates hypothetical temperature histories (profiles) similar to those encountered during food heat preservation or storage (top plot) and calculates and plots the corresponding vitamin C, AA and DHAA concentration curves (bottom plot). 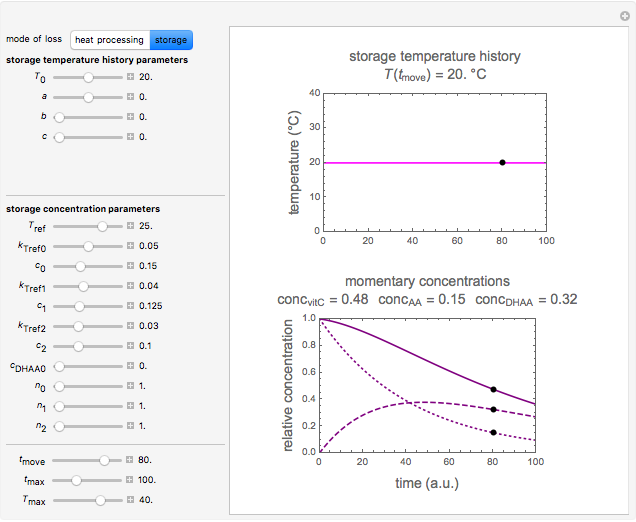 The reference temperature for the exponential model and the kinetic parameters AA and DHAA, namely the triplets , , ; , , ; and , , , are selected with sliders. For a case where some DHAA is already present initially, the slider is set to the appropriate fraction, for example, 0.1, in which case the initial AA concentration will be automatically set to , that is, 0.9. 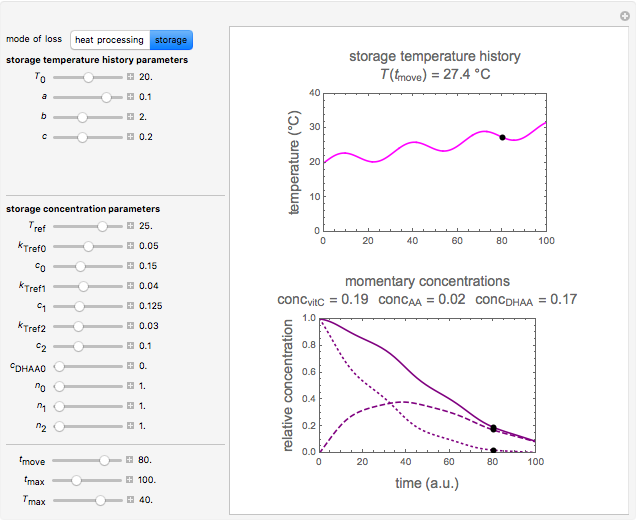 Set the plot time and temperature scales with the and sliders. By changing the position of the slider, three black points are moved simultaneously on the three curves and the numerical values of the momentary vitamin C, AA and DHAA concentrations are displayed. The emphasis of this Demonstration is to introduce the model and calculation procedure, not to describe any particular food or foods. Thus, not all parameter combinations and resulting generated vitamin C, AA and DHAA concentration versus time curves necessarily have a counterpart in reality, and conversely, there may be food systems that are not represented by the model. M. C. Vieira, A. A. Teixeira and C. L. M. Silva, "Mathematical Modeling of the Thermal Degradation Kinetics of Vitamin C in cupuaçu (Theobroma grandiflorum) Nectar," Journal of Food Engineering, 43(1), 2000 pp. 1–7. doi:10.1016/S0260-8774(99)00121-1. L. Verbeyst, R. Bogaerts, I. Van der Plancken, M. Hendrickx and A. 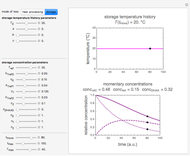 Van Loey, "Modelling of Vitamin C Degradation during Thermal and High-Pressure Treatments of Red Fruit," Food Bioprocess Technology, 6(4), 2013 pp. 1015–1023. doi:10.1007/s11947-012-0784-y. M. Peleg, M. D. Normand and M. G. Corradini, "The Arrhenius Equation Revisited," Critical Reviews in Foods Science and Nutrition, 52(9), 2012 pp. 830–851. doi:10.1080/10408398.2012.667460. Mark D. Normand and Micha Peleg "Vitamin C Loss in Foods During Heat Processing and Storage"